Tsukiji fish market is the biggest seafood market in the world. Food of the highest quality is gathered from all over the world, not only fish, but also vegetables, fruits and other delicacies. This food tour starts in Tsukiji fish market, where you will be able to walk through outer market and wholesale area and taste many Japanese foods such as fresh tuna, sushi, omelettes and more! Afterwards, you will move to Asakusa, the most traditional town in Tokyo, and go to a traditional cafe with Japanese sweets. On this tour, you will learn the Japanese culture through Japanese food like locals do! *15th Oct.- : Tsukiji inner market would be closed and move to Toyosu. From 15th Oct, we will do shorten tour(4.5 hours). Please check the information below. 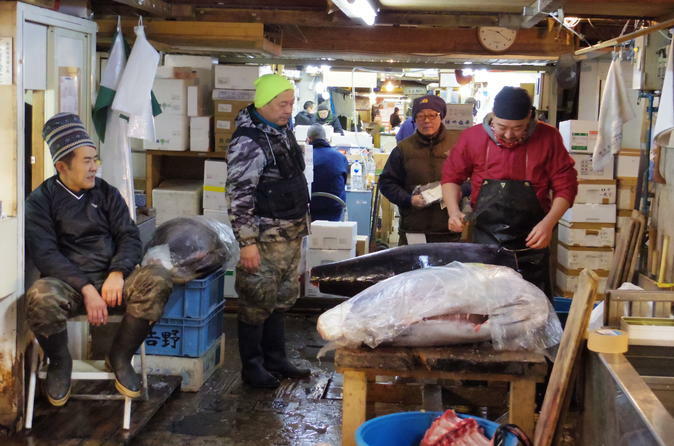 Meet your guide in front of the gate of Tsukiji Honganji Temple at 8:15 am and start exploring the Tsukiji fish market with a history of 80 years as the biggest fish market in Japan. Even for local Japanese people, Tsukiji is a special place to buy freshest and highest quality seafood and ingredients. This market is also special place for chefs. Many chefs of Michelin-star restaurants come and buy special ingredients in Tsukiji. On this food tour, you will learn about Japanese culture while sampling various kinds of symbolic Japanese food including Japanese style omelette, dried bonito, Japanese tea, fresh tuna, fried fish cakes, sake, sushi, and Japanese sweets. Menu items are subject to change depending on availability and season.